I am in awe of authors like Kristin Cashore who could think of things like this. I am sorely deficient (at least, I think I am) in the supernatural/fantasy realm, so I am always in awe of people who can think of awesome story concepts like these. Don’t you think? 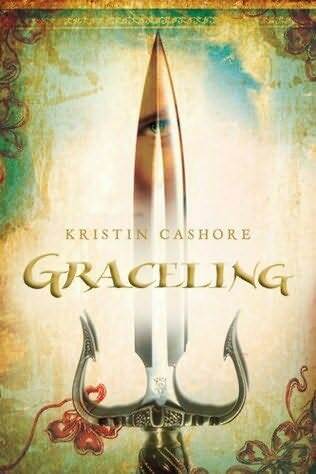 To those unfamiliar, here’s the basic premise of Graceling: Gracelings are humans who are born with an extraordinary skill. These skills don’t manifest until sometime later in the human’s life, and the clue to see if a human is a Graced is if they have two different colored eyes. Graces can range from the most useless — like reciting things backward or staying underwater for a long time — or useful, like sensing storms or like Katsa’s Grace, killing. If a Grace is found useful, the Graceling will be acquired by the King to serve his court. This is what Katsa grew up in ever since she accidentally killed her cousin who tried to touch her during a party when she was young. Convinced that her Grace was killing, Katsa was trained to be a killer so she can serve her uncle, King Randa’s court. Simply put, Katsa was a thug, who threatens and kills people who the King of Middluns feel like punishing. But Katsa soon grew tired of this life, and she secretly started a Council. Together with some of her closest companions — they weren’t friends because Katsa never considered them friends — they helped other people secretly. They arrested bandits, protected people and saved Prince Tealiff of Lienid, who was kidnapped and hidden in Murgon. On the rescue mission, Katsa meets Po, another seemingly Graced fighter. Pretty soon, Po becomes a part of Katsa’s life, and thus started Katsa’s personal struggles. She soon learns to face her rage, stand up for herself, find love and realize an important thing about her Grace that she never thought was even possible. If you think the summary I posted there was already good, well I tell you, the book is really way better than that. I loved every bit of the book. I thought I’d find some parts of it slow, like what a friend told me, but I never thought it was slow at any part. I was surprised with the discoveries that Katsa made about Po and herself. I felt that I was really in the story, like I was with Katsa and Po in their travels and fights to find out who was behind Po’s grandfather’s kidnapping. Now, I don’t know if I would have had an entirely different reading experience with Graceling if I didn’t read Fire first. I was slightly spoiled about who King Leck really was and what he can do because of what I read in Fire. There were no other mentions of Gracelings in Fire so I don’t think it’s a really big effect in my reading experience, but I wonder if I would have been more surprised with what Leck could do in the novel. Oh, but just thinking of Leck makes me think of a creepy man. Ugh. Kristin Cashore is writing a third book, which is Bitterblue, who also appeared in this novel. I wonder if Kristin will somehow bring back the monsters from The Dells in this third book — that would be really interesting, I think.